One of the coolest trends I've been seeing lately in the nail polish blogging world is creative bloggers creating their own polishes. I really like this trend. I think bloggers/nail addicts know what the nail polish people love most. One of these creative people is a Canadian blogger, Pam. Pam, has started up her own line of polishes called "Girly Bits". She does all of the work herself in mixing the colors and filling the orders! Her first collection is called "Sea's the Day" and the colors I received are awesome from color to formulation. 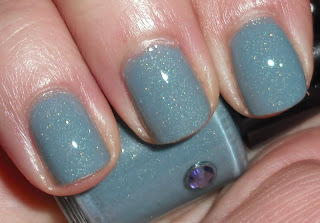 Stormy Skies is a gray with slight-blue undertones jelly with gold/green microglitter. This color is beautiful! I saw Pam's swatch of this before she started selling her polishes and I was instantly in love with it. Gray-jelly-glitter = happy camper. The formula on this was smooth and applied evently. The glitter in here is remisnicent of the glitter in BB Couture polishes like Hermosa Surfer Girl and Horned Devil. 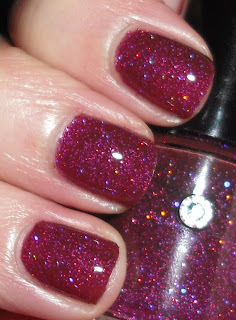 Razzle Dazzle is a raspberry jelly with scarttered pink/purple holograhpic glitter. When I first saw this polish in the bottle, I admit I was scared. 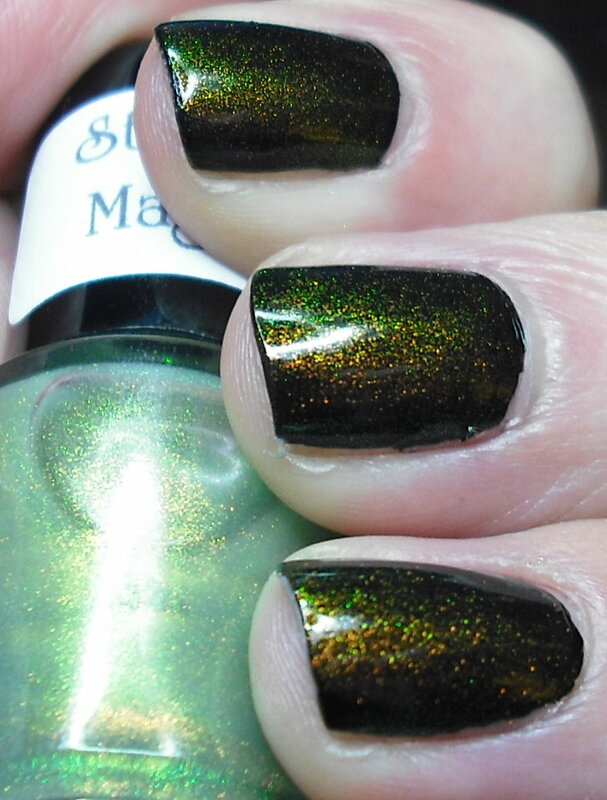 Usually, glitters like this mean clunky and thick formula. I was pleasantly surprised this was not the case with Razzle Dazzle. It was not even the slightest issue at all. This applied like a creme or shimmer. The formula like Stormy Skies, was smooth, easy to work with, and applied evening. Did I mention this color rocks too? Street Magic is a duochrome color shifting top coat. This flashes green, gold, copper, amber and etc. Color Shifting polishes these days are rarity, so this a joy to have. It is gorgeous, you get a different look depending on the angle and lighting you look at it under. 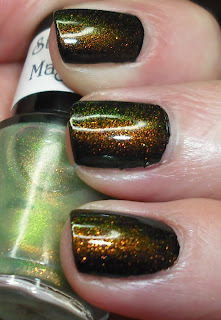 The formula was equally as great with this polish as the others. Overall, I love these polishes. The colors are original. The formula is spot on. In fact, I found the formula of these superior to many of the traditional brands. Plus, these are done by a blogger. That makes them extra special. Great collection by Girly Bits! I will be ordering some of the other colors when I'm not in the hole from holiday shopping! To see the rest of the colors in the collection and how to order check out Girly Bits ordering page. 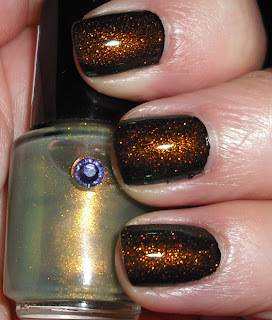 Oooh Razzle Dazzle and Street Magic are stunning! Wow, I love these!! And I agree, I am totally digging all the frankens coming out lately! Ohh, these are all very pretty. I also really like the rhinestone on the bottles. What a cute idea! Oh wow! These are stunning! especially the last one! Did you do Stormy Skies over any base for this picture?